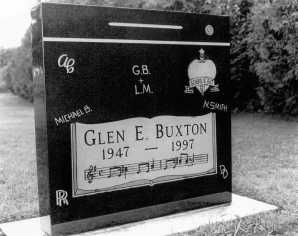 That’s the coolest tombstone I’ve ever seen (surely you guys can read that musical score). When Peter reminded us of how bad Alice Cooper became as a solo artist, it reminded me of how really good the Alice Cooper band was. A decent chunk of that really goodness was guitarist Glen Buxton, who veered off the path and died years ago already. Wow, psychedelic garage punk with Neal Smith crashing the drums. I love it. Never heard this before either. I always thought pre-“Love It To Death” Alice was just the Frank Zappa-like stuff of “Pretties For You” and “Easy Action” which I don’t care for. Thanks, Gene. i totally agree Steve. once Alice went the way of “Welcome To My Nightmare,” i really lost interest. which is funny because that is sort of when the rest of the world embraced him. but, man, that band defined garage band in the best of all possible ways. i still love “Love it to Death” and “Killer” so much it is sort of crazy. and, again, i was not too fond of the first two Cooper forays for Frank. Love the Spiders. I had no idea.